You might remember that Gary Neville once compared picking between Manchester City and Liverpool to win the Premier League title to choosing one of two men to nick his wife. That famous comment came in 2014 and the former Manchester United right-back is going through a similar dilemma this season. The Premier League title race has looked like a two-horse race from almost the first kick of a ball last August and as the run-in intensifies, Neville would likely prefer City to come out on top because he has grown accustomed to their recent success. Liverpool are well-positioned for a legitimate title challenge this term and many believe they are destined to lift the Premier League trophy for the first time in their history due to their recent late winners. On Friday night, Jordan Henderson came off the bench for Jurgen Klopp's side and assisted Mohamed Salah's goal before scoring Liverpool's third of the game to ensure all three points. And after the full-time whistle, the Reds captain seized the opportunity to rub some salt in Neville's wounds. 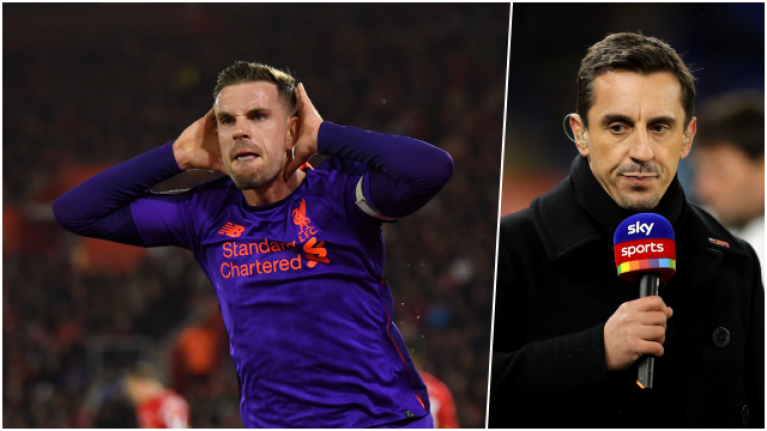 Speaking on Sky Sports, Neville revealed: "Jordan Henderson came over to me at the end of the game and said ‘you don’t look very happy’. "And I said ‘I’m not Jordan’. "I feel cold [about title race] because I’ve not got a particular favourite between either side to win the title. "I am sat there thinking it’s an inevitability. Once they got control and hold of the game. "I just asked five seconds before what odds Liverpool were to win the game. I’ve never felt so sure that Liverpool were going to win the game. "It just felt like it was absolutely going to happen."